Thanks to investment by First Buses and by the Council using Growth Deal money from central government, new vehicles will soon be running on the routes through Probus, Tregony and Grampound. On the no. 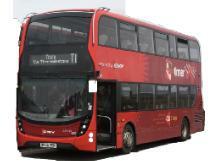 27 route, Truro-Probus-Grampound-St Austell-Bodmin, there will be new double-deckers similar to those that are already running on the Truro-Camborne-Penzance and St Ives route and to and from the university at Penryn. These are low emission vehicles with on board wifi and charging points for mobile phones and tablets. Their introduction should improve the reliability of services on this route. On the no. 22 and no. 50/51 routes, there will also be new single-decker vehicles, also bringing about lower emissiions and improved reliability. Users of the bus station in Truro will know that the surface where the buses manoeuvre and park is in a bad condition with subsidence in many places. The bus station will close on 26 March for 10 weeks while the carriageway is repaired and resurfaced by Cormac. This is being funded through the Council's One Public Transport Programme budget. At the same time, First will decorate and improve the interior customer waiting area. Whilst the bus station is closed, incoming buses from Probus, Tregony and Grampound will stop at Quay Street where passengers can disembark. To board buses leaving Truro for those places, please use Boscawen Street, the stop outside of Wilkinsons. Real time information is now available for all buses running in this area. The information can be obtained using an app on mobile phones, or on real time information boards available at some bus stops, e.g. in Grampound Fore Street and in The Square, Probus. Additional real time information boards are going to be installed in The Square, Tregony and in Probus at the stop by Treviglas Lane. This will mean that passengers waiting for buses at these locations will have better information about what is happening to the bus that they are waiting for. This should happen within the next few weeks. 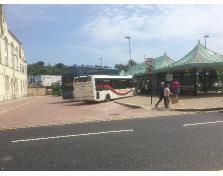 The bus station has now re-opened following the resurfacing. Services are back to normal.